- Email us your list of items desired. Then mail us a check or money order. are beautiful holiday gifts to give and treasure. Each is a coin like piece of silver and comes in soft clear plastic. Contains 1 troy ounce of solid 99.9% pure silver with a nice proof -like mint condition surface. Makes a nice treasured gift. Great for the Christmas holiday season. 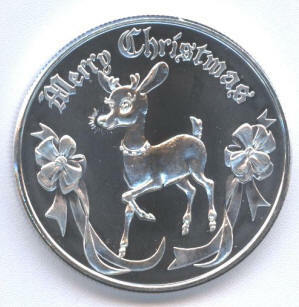 All of the Christmas silver rounds come to us packaged in coin tubes of 20 coins. Individually sealed is soft plastic (or we will include a soft poly zip lock type bag for each) so that you can give them as gifts. Size is about the same as a silver dollar coin. These will fit in our Airtite Silver Dollar 38mm holders. Now on our new website! 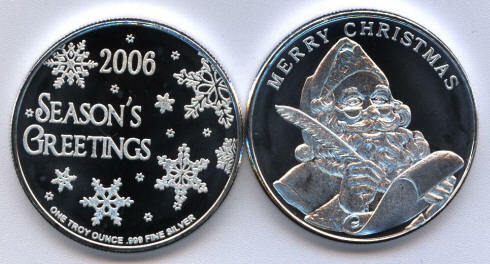 New 2009 dated silver rounds and Christmas silver bars have been moved to our other website. Click here to view current prices and availability. Please order early. We usually sell out of these a few weeks before the holidays. and get a nice assortment, too! These will fit in our Airtite Silver Dollar 38mm holders. Want a mixture of the following designs? "2006 Season's Greetings" and snowflakes on back. About the size of a silver dollar coin. Click coin picture to enlarge. 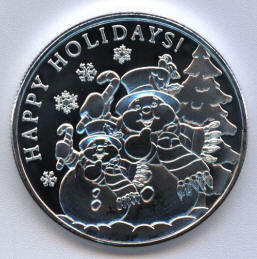 This Christmas silverround features a Snow Man scene. 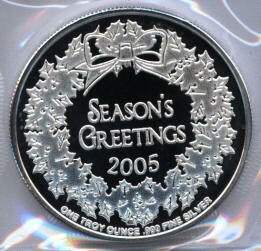 As with he above silvers each coin like Christmas round is marked "one troy ounce .999 fine silver" and has the same "2006 Season's Greetings" snowflake reverse design as the one above. Perfect for gift giving. 1 ounce of pure solid 99.9% silver minted in round coin form. 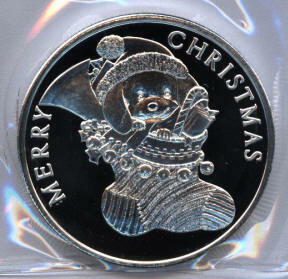 These snowmen silvers are about the size of a silver dollar coin. 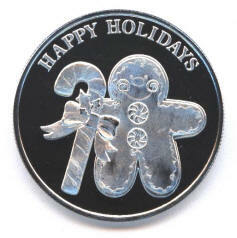 This Christmas silverround features a GingerBread Man holding a Candy Cane. 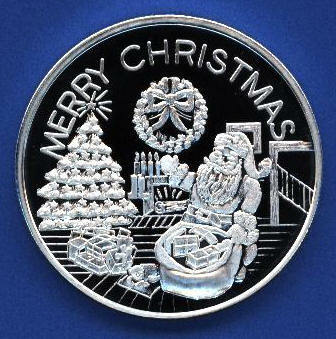 Like the above silvers each coin like Christmas round is marked "one troy ounce .999 fine silver" and has the same "2006 Season's Greetings" snowflake reverse design as the one above. Perfect for gift giving. 1 ounce of pure solid 99.9% silver minted in round coin form. 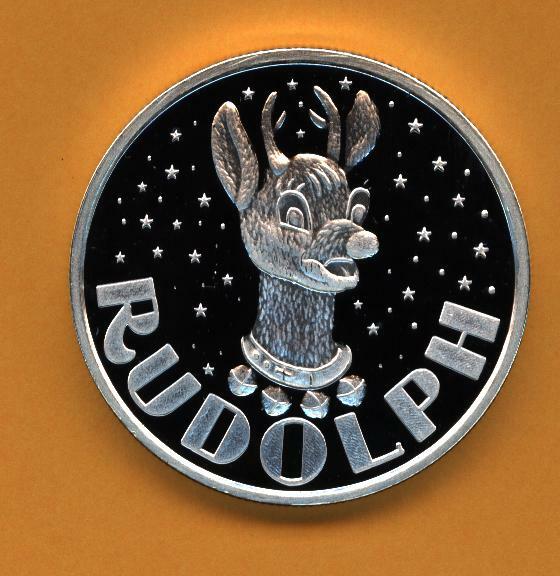 This Christmas silverround features Rudolph the Red Nosed Rein deer . 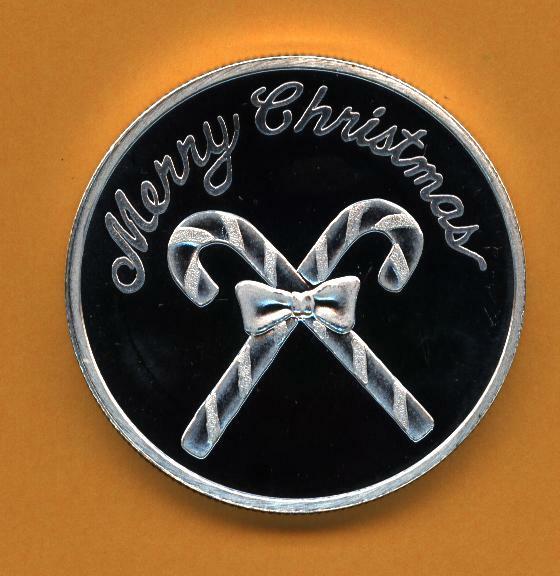 Like the above silver coin like Christmas rounds, each is marked "one troy ounce .999 fine silver" and has the same "2006 Season's Greetings" snowflake reverse design as the one above. (See 2007 styles.) Perfect for gift giving. 1 ounce of pure solid 99.9% silver minted in round coin form. 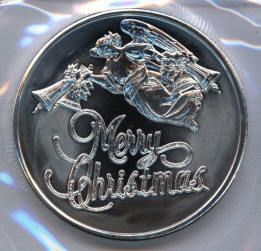 These Christmas rounds and coins will fit in our AirTite Silver Dollar 38mm holders. Wreath and "Season's Greetings 2005"- on back. Individually packaged in clear soft plastic. Perfect for gift giving. 1 ounce of pure solid 99.9% silver minted in round coin form. dated 2005 About the size of a silver dollar coin. 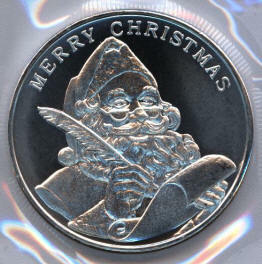 Same 2005 reverse side as the Santa above. Perfect for gift giving. 1 ounce of pure solid 99.9% silver minted in round coin form. dated 2005 About the size of a silver dollar coin. 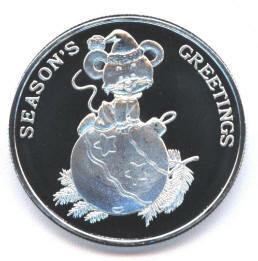 Same 2005 reverse side as the Santa. Perfect for gift giving. 1 ounce of pure solid 99.9% silver minted in round coin form. These medallions are about the size of a silver dollar coin. Can be used in any year, because no date is printed on this style. Shows Rudolph the Red Nosed RainDeer on the front. Perfect for gift giving. Medallions are 1 ounce of pure solid 99.9% silver minted in round coin form. About the size of a silver dollar coin. Perfect for gift giving. 1 ounce of pure solid 99.9% silver in each. Depicts a decorated Christmas treat with a large American Flag next to it. Great for anyone who loves the USA and celebrates Christmas. About the size of a silver dollar coin. Can be used any year. No year is printed on these. 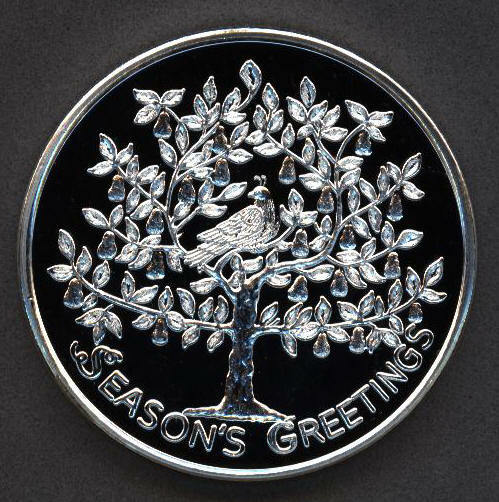 Beautiful intricate design with a Partridge Bird in a Pear tree and "Seasons Greetings" at the bottom. Perfect for gift giving. Contains 1 ounce of pure solid 99.9% silver in each round. About the size of a silver dollar coin. Perfect for gift giving. 1 ounce of pure solid 99.9% silver in each. 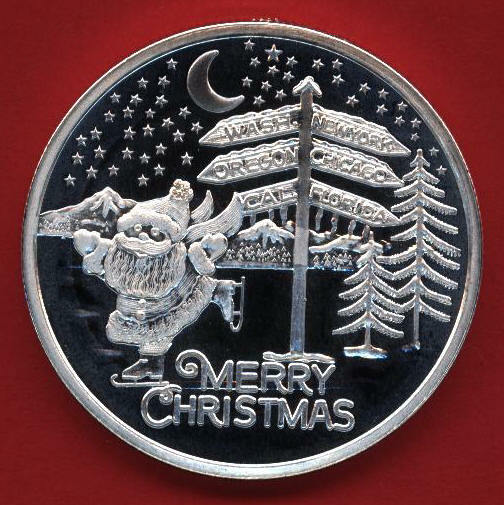 Depicts Santa Clause skating or dancing at the North Pole. About the size of a silver dollar coin. Perfect for gift giving. 1 ounce of pure solid 99.9% silver in each. Depicts Santa Clause delivering presents. About the size of a silver dollar coin. Shows Santa's head (with his white beard) and a bag of toys over his shoulder. Perfect for gift giving. 1 ounce of pure solid 99.9% silver in each. About the size of a silver dollar coin. All of the styles on this page have the same reverse design. Perfect for gift giving. 1 ounce of pure solid 99.9% silver minted in round coin form. About the size of a silver dollar coin. We often run out of these a few weeks before the holidays. ( c ) 2003 J Ly n n a n d C O . . . . . . . .